So is it Uobei Sushi or Genki Sushi? 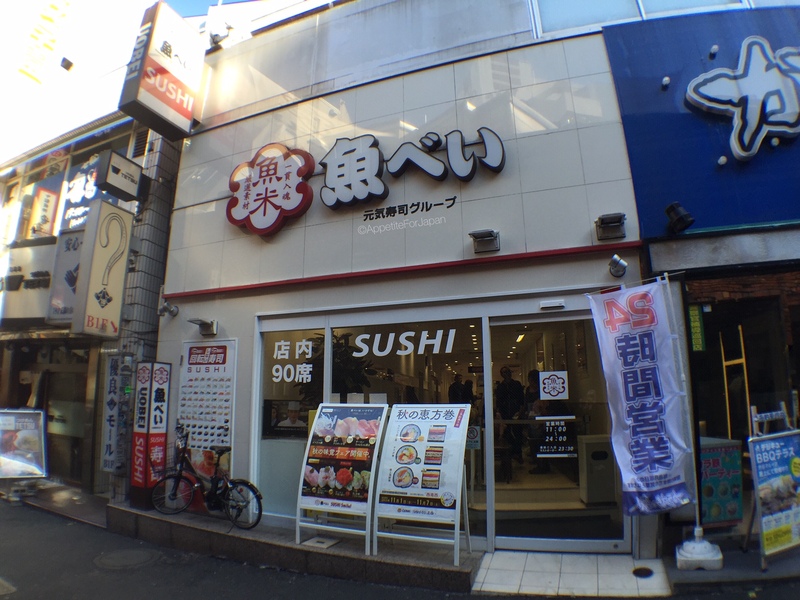 Both the Uobei and Genki Sushi chains are related, and they both have a store in Shibuya. 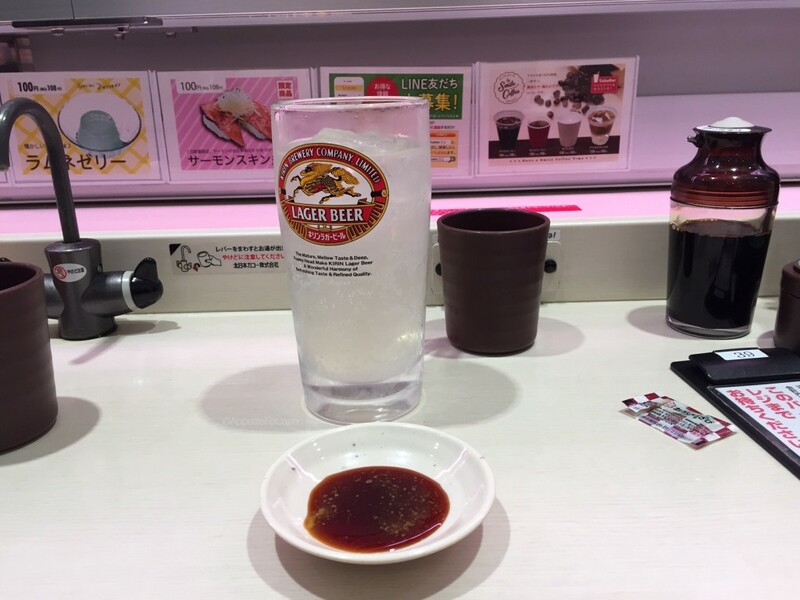 They’re both owned by Genki Sushi Co. Ltd., and this post specifically refers to the Uobei Sushi restaurant in Shibuya. 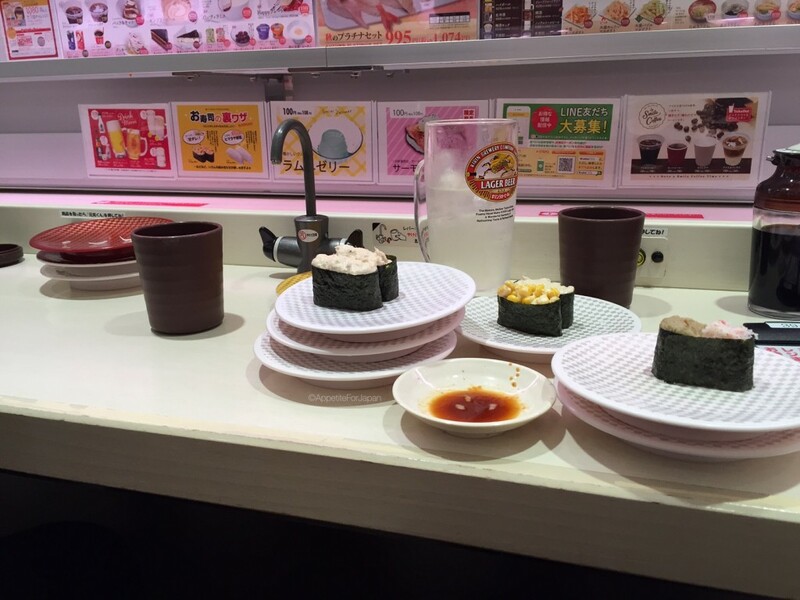 It’s located in a small street behind the famous Shibuya 109 shopping centre (the Genki Sushi restaurant is closer to Center Gai, just near Forever 21). Uobei Sushi attracts large queues at lunch and dinner time, but if you time it right, you can walk right in. When you arrive, you’re handed a small clipboard. This has your seat number and a barcode. A staff member will point to the area where your seat is, and your number at the bottom of the touch-screen that you’ll use to order your food. 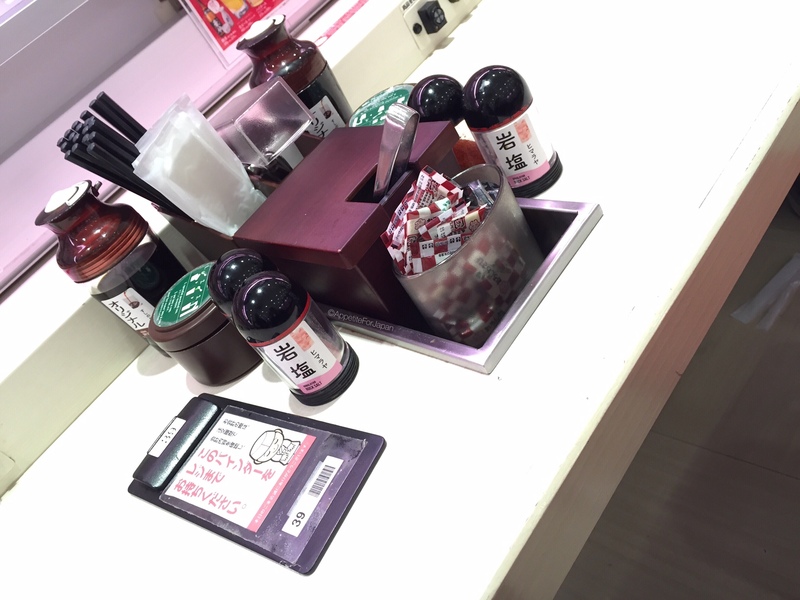 When you select the item that you want to order, you must tell it how many plates you want (a plate generally has two pieces of sushi, although you can order other things as well). You can order up to three plates at a time – and you can place as many orders as you like. Just moments after you confirm the order, the plate(s) will whiz out from the kitchen, stopping right in front of you. 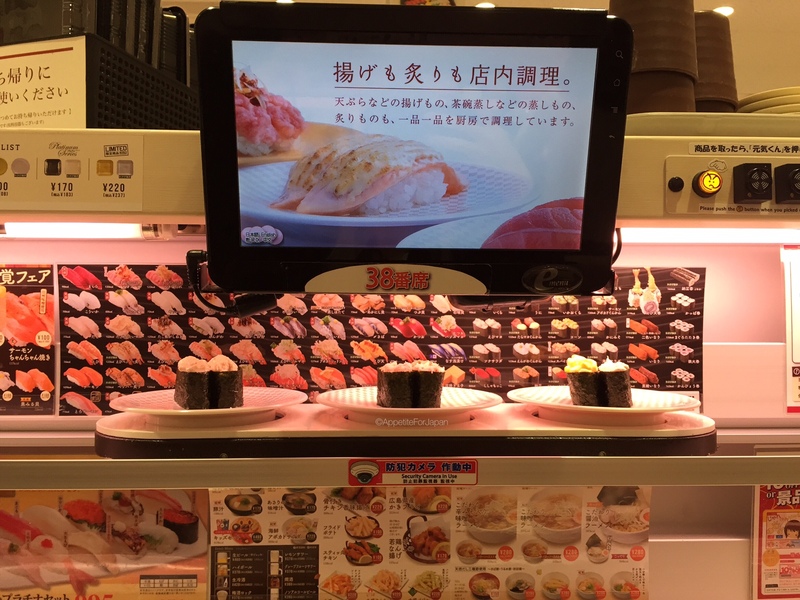 What this means is that – unlike the more traditional sushi trains (known as kaiten-zushi in Japan) where a plate goes ’round and ’round on the conveyor belt for hours (have you ever seen someone choose a plate, take off the lid, then change their mind and put it back? ), or where staff might get confused and give your freshly made aburi salmon to the table next to you – your sushi is delivered straight to you at lightning speed before anyone else can get their hands on it. 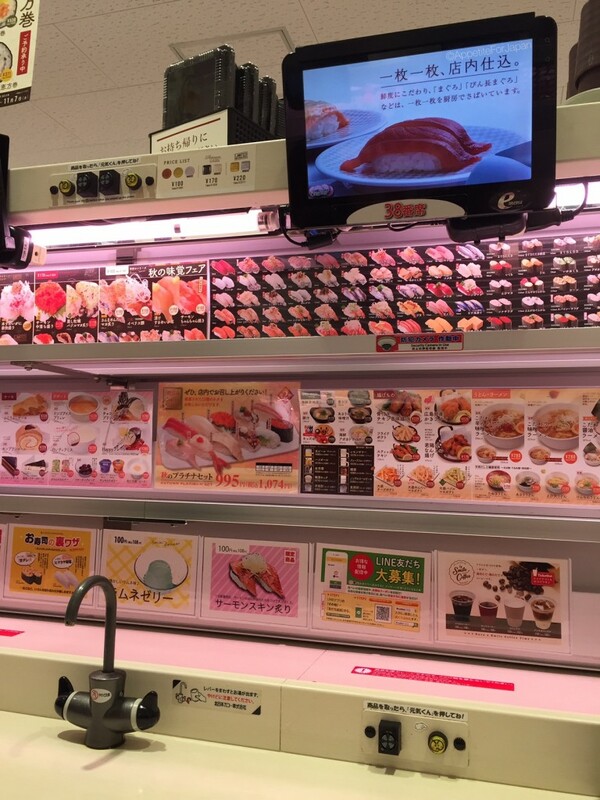 Once your plate has arrived, take it off the little holder (I’m not sure what else to call it), and press the button with the little frowning face (that’s the Genki Sushi logo – you’ll notice that the button is lit up yellow) to the right of your touch-screen. This will send the plate holder flying back to the kitchen, ready to be loaded up with more food. Drinks are also ordered on the touch-screen, but these are carried over to you by a staff member. I guess the futuristic method of delivering the sushi isn’t really designed for liquid. And speaking of drinks, they sell alcohol here. I accidentally ordered a very large alcoholic grapefruit soft drink when we visited. 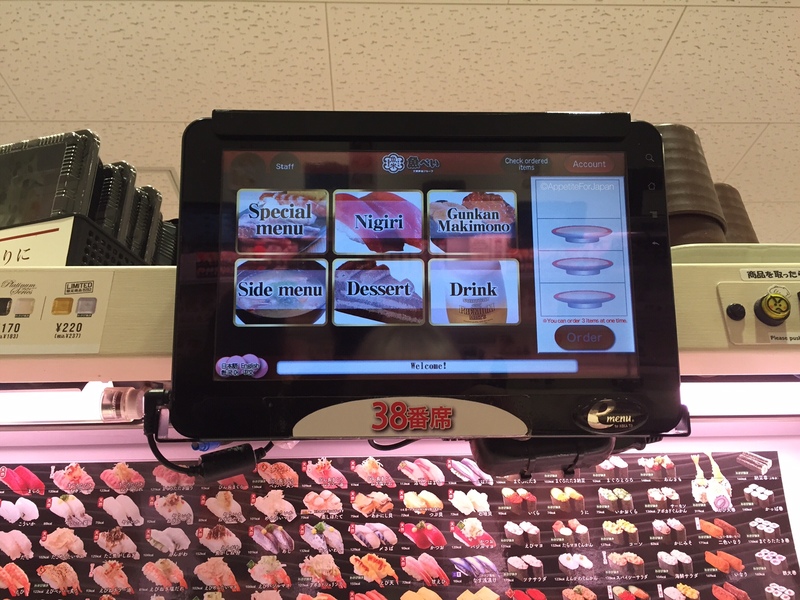 I’m used to touch-screen systems that only display the items in one particular category at a time (ie, alcoholic drinks are in a separate section to non-alcoholic drinks, and you have to exit out of one section to view the next), whereas at Uobei sushi, once you’ve viewed all three or so pages of soft drinks, when you click ‘next’, it’ll go to the alcoholic drinks (‘grapefruit sour’ should have tipped me off that it was alcoholic, but hey!). And so I started my day with a large alcoholic beverages – I was on holidays so I was okay with that. 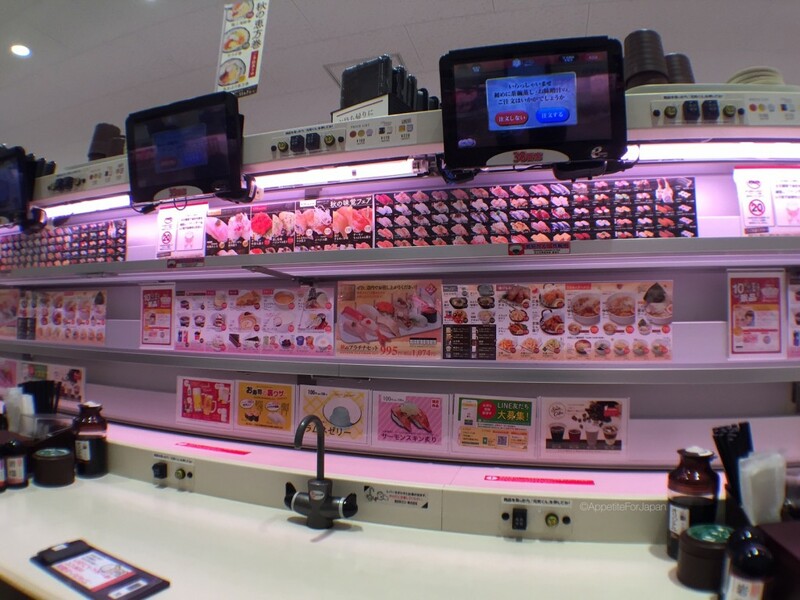 If you just want to drink water or matcha tea with your sushi, you can find cups on the top shelf right in front of you – just stand up and you’ll see stacks of cups behind your touch-screen. You’ll also find take-away containers (or take-out, for my American readers), should you want to take some sushi with you. Everything else that you’ll need is right next to you. Soy sauce, wasabi, ginger, a little tap to pour hot water for your matcha tea, chopsticks and moist towels for your hands. 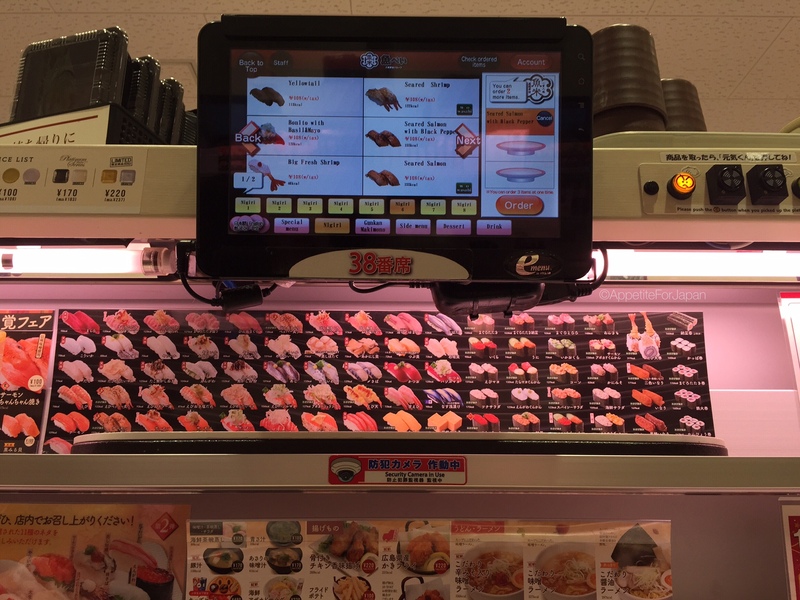 If the sheer convenience and futuristic order/delivery method is not enough to sell you on taking a trip to Uobei Sushi, the price should do the trick. 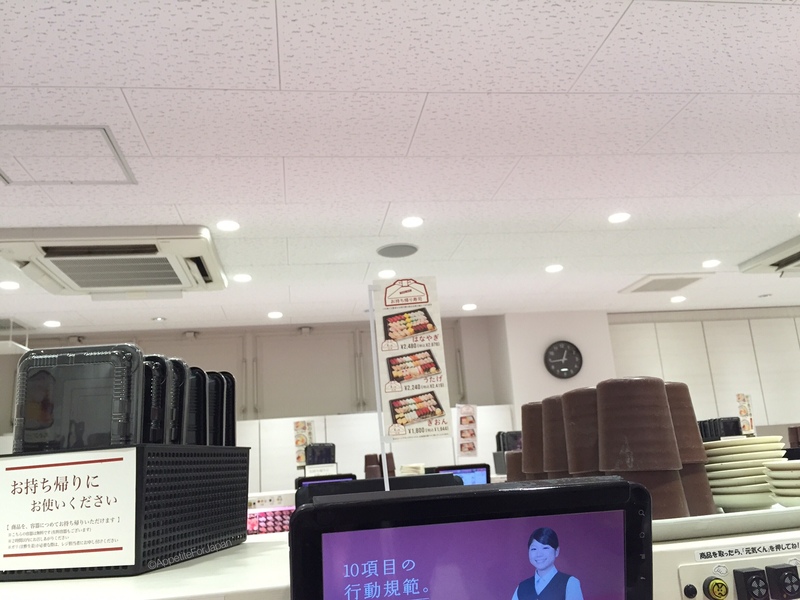 Most of the plates are only 100 Yen (that’s a mere US$0.84 or AU$1.20 at the time of writing) each. Of course, this is before tax, which is 8% – so really the plates cost 108 Yen (I wish they would just include tax in prices, but alas, they usually add it on afterwards) – but that’s still incredibly reasonable. 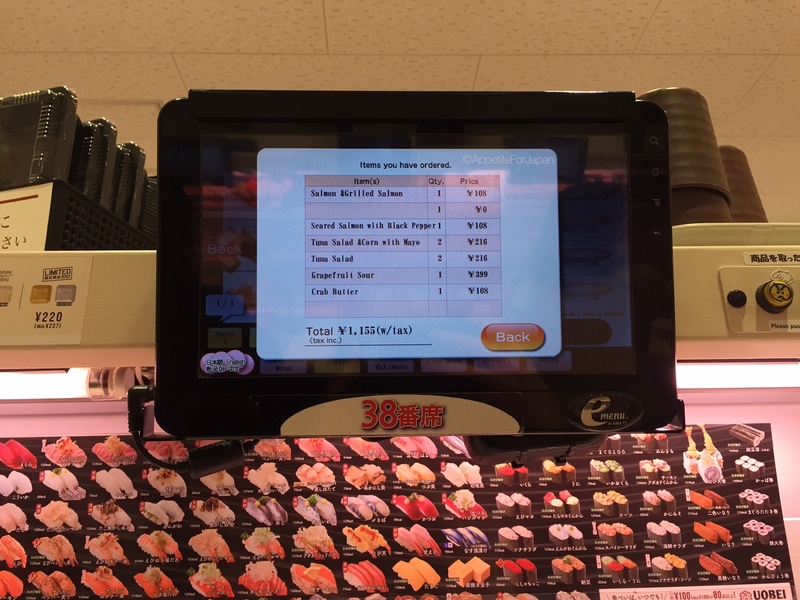 For that price, of course you’re not going to find the very best sushi in Japan, but it’s completely decent, and a great option for a very fast, very cheap meal. If you’re a tourist, food that is quick, cheap, tasty and safe to eat is always worth knowing about. And plenty of locals can be found queuing up for Uobei Sushi – another sign that it’s worth a try. The menu is fairly extensive, and you can find it here. To keep track of how much you’ve ordered, select “Check Ordered Items” toward the top left corner. Once you’ve finished your meal, click “Account” (right next to “Check Ordered Items”) and then select “Checkout”. Then simply take your clipboard to the front counter where they’ll scan the bar code which is linked to the touch-screen (hence why you need to sit at the same number touch-screen as your clipboard) so that you can pay. If you’re lucky, your touch-screen might invite you to play a game of Scissors, Paper, Rock. 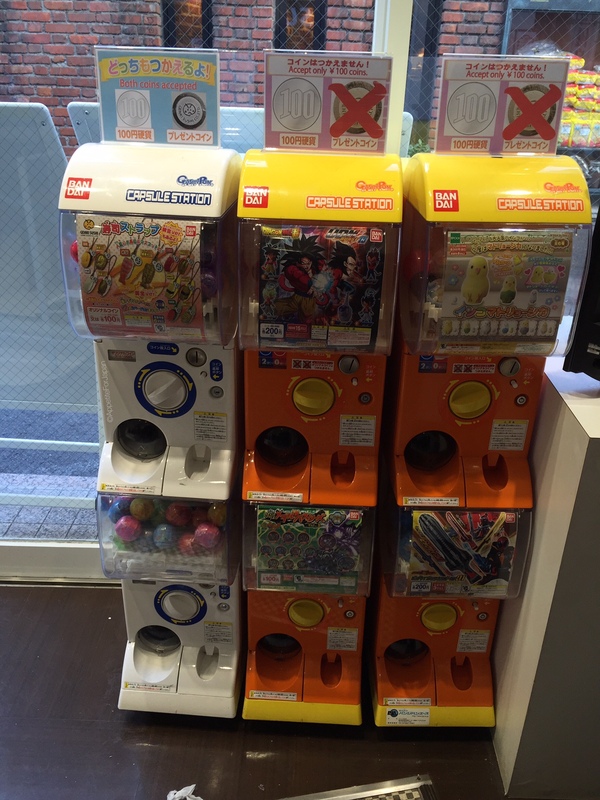 If you win, you’ll get a special token that you can use for the Uobei Sushi gachapon toward the front of the store. You can use the token in two of the capsule machines (there are six altogether) which have Uobei Sushi key-ring/phone charms. If you don’t get to play, or – like me – you don’t win the game, you can pay 100 Yen instead. Would I recommend Uobei Sushi? Absolutely. We have a pretty broad budget when it comes to food in Japan. Sometimes we eat at expensive places, and it’s great to offset this with some super cheap meals too. Japan is a great place when it comes to food, and I’m not joking when I say that my partner and I pretty much eat our way around Tokyo. 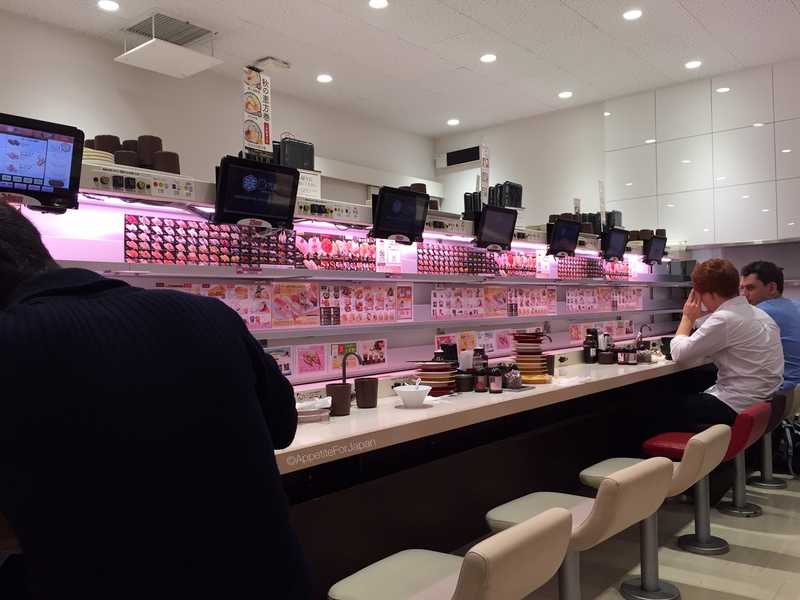 Between some of the pricier meals, it’s amazing being able to eat perfectly good sushi at 108 Yen per plate. And as I said earlier, sure, it’s not the very best sushi in Japan, but it’s good. 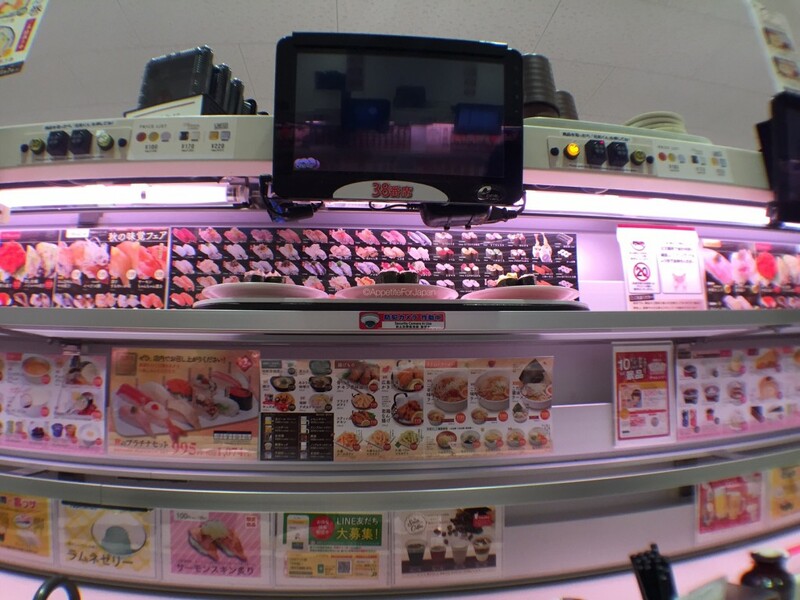 After all, this is Japan and there is no better place to eat sushi. As long as there are plenty of people (especially locals) eating there, then it’s probably good, and Uobei Sushi ticks all the boxes. I will definitely be eating there again in the future. 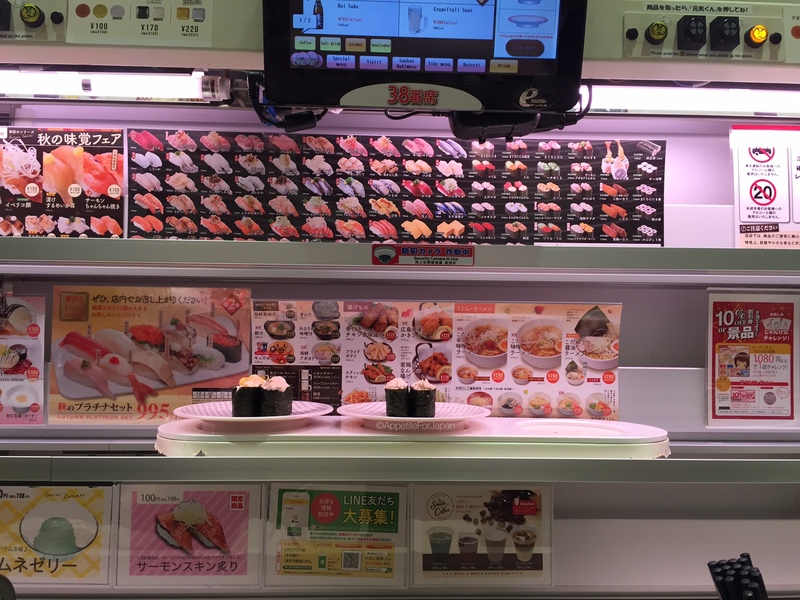 There are plenty of other Uobei Sushi stores around Japan. If you’re interested in visiting one of the other locations, you can find the full list here.